With Liverpool Psych Fest 2014 looming on the horizon, Getintothis’ Richard Lewis takes a trip to discover some of the acts who may have slipped under the cosmic radar. Now in its third year, Psych Fest is slowly but surely building Liverpool’s reputation as one of the psychedelic capitals of the world. Every year hoards of psych-heads ascend on the Camp and Furnace to witness some of the world’s finest experimentalist explorers, as well as Liverpool’s homegrown freaks and oddballs. This year, running the gamut of international psych luminaires, taking in the shamanic voodoo of Goat, the skewed folk rock of Woods, Canadian psych-pop alchemists The Besnard Lakes and the sunburst Californian melodies of the Allah-Las, all of the above names will be familiar with devoted psychonauts. Flying the freaky flag for Liverpool will include garage rock outfit Strange Collective, as well as Barberos, who will be occupying the minds of the masses with their multi-sensory immersive installation LOLA. Encompassing shoegaze, Kosmische, prog-rock, chamber pop, whimsical folk and every conceivable point in between, Getintothis have handpicked a selection of groups and projects never before featured in our pages, who are gracing the stages of Camp & Furnace in just under a fortnight’s time. The melodic, immediate sector of the vast psych spectrum, Younghusband pick up the baton from their 1990s antecedents (Ride, The House of Love, Slowdive) and sprint forwards with their own take on melody-drenched shoegaze. Signed to Sonic Cathedral, the estimable home of nu-psych, the essence of the group’s sterling 2013 debut platter Dromes is condensed into excellent lead single Silver Sisters. Tapping into the early works of Tyrannosaurus Rex and folk titans Fairpoint Convention, Parisian polymath Orval Carlos Sibelius creates dusky psych-pop tunes. Like Syd Barrett-era Pink Floyd, the songs have a deceptively sunny disposition that masks the gently unsettling atmosphere and skewed lyrics within. Third album Super Forma issued last year received positive acclaim as well as introducing the band to an audience beyond France. Long standing psychedelic stalwarts, The Asteroid #4 are fellow cosmic travellers alongside fellow San Franciscans The BJM. Founded in 1998, the band had something of a rebirth with this year’s impressive eponymously titled set. In thrall to The Grateful Dead and the cosmic country of The Flying Burrito Brothers, the group splice rustic americana with Kosmische rhythms. Best known for his day job as a live guitarist for Melody’s Echo Chamber, Pablo Padovani has created a highly impressive extra-curricular sideline with Moodoïd. Sounding like Spiritualized if Jason Pierce had grown up in Paris as opposed to Rugby, last year’s self-titled debut EP was enthusiastically greeted while last month’s debut LP Le Monde Möö scooped excellent reviews. A definite highlight of this year’s Sound City playing two sets in one evening, the band are a mesmeric live spectacle. 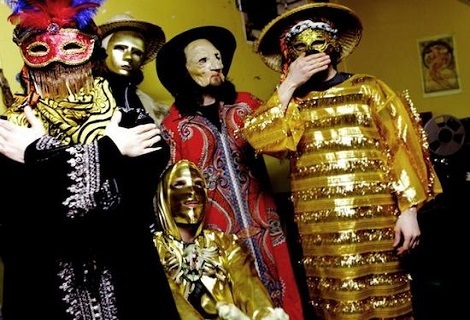 Staying on that side of the Channel, Rennes revivalist psych-pop crew Sudden Death of Stars made their Liverpool debut earlier this year at a sold out show supporting The Lucid Dream. The second album by the six piece All Unrevealed Parts of the Unknown evoked the softer moments of The Velvet Underground’s catalogue crossed with elements of The Small Faces and Gallic pop. Swirling with mantra-like feedback, submerged vocal chants and hypnotic repetition, Bristolian crew Anthroprophh continue the mission deep into space rock begun by Hawkwind. Singed to Rocket Recordings alongside 2014 Psych Fest participants Hills, GOAT and Teeth of the Sea and 2013 alumni Mugstar, We is a fine showcase of Anthroprophh’s monolithic sound. Purveyors of XL proportioned sonic leviathans, Portuguese maximalists Black Bombaim share stoner rock lineage with Dead Meadows and early Black Sabbath. Infusing the sludgy riffs with fluid interplay and sonic invention a la contemporaries White Hills, the band issue albums that feature one sprawling cut per side of vinyl. Far Out, the band’s none-more-aptly titled third LP released in April honed their craft even further, as heard on the stunning likes of Africa II. Fellow countrymen and labelmates with Black Bombaim on the curiously monikered Lovers and Lollypops label, Jiboia trade in an electro-spiked variant on Moroccan desert music. The one man project of Oscar Silva, who describes their sound as ‘Prince of Persia on acid’, Jiboia’s eponymous debut EP quickly sold out its limited edition run. Well received at the Reverence Festival, the release of Jiboia’s debut LP Badlav meanwhile follows hard on the heels of Psych Fest. Part of a strong contingent of Scandinavian psych bands at the festival, Stockholm quartet Les Big Byrd have honed their own take on drone rock, throwing US indie and propulsive rhythms into the mix. The title track of this year’s lauded Back to Bagarmossen EP produced by BJM mainman Anton Newcombe, laid the ground for debut LP They Worshipped Cats, released through Newcombe’s label A Records. Direct from the wellspring of Kosmische music Berlin trio Camera continue to the mission established by their ground-breaking forbears in the 1970s. Famed for their guerilla gigs on the streets of the German capital and the U-Bahn, the trio have won the approval of the acts who influenced them, notching up live collaborations with Krautrock legends Dieter Mobius of Cluster and Michael Rother of Neu! Receiving a huge boost to their profile on this side of the Atlantic through their support stint with The Brian Jonestown Massacre round much of the UK earlier this year, Vermont duo The Vacant Lots are firmly in the ascendant. Departure, the band’s excellent debut LP juxtaposes minimalist electronic textures, raucous garage rock guitars and beat poetry to spellbinding effect. The group’s recasting of Suicide and early New Order into dazzling shapes is much in evidence on new 45, the synth steeped Paint This City.